George White was born in 1895, the second child and eldest son of Charles William Isaac and Caroline Ann White of Stag Road, Lake, Isle of Wight. His interest in the army doubtless came about because of his father's involvement with the 5th Volunteer Battalion, Hampshire Regiment i.e. The Isle of Wight Rifles. Charlie joined the Volunteers in 1893 and by 1908, when the Volunteers became a Territorial Battalion, he was a Colour Serjeant and a crack shot. It was not long before George learned to shoot and when he was old enough, joined the Isle of Wight Rifles. As Territorials, The IW Rifles were only obliged to fight in the UK, but many, including George, volunteered for overseas service, and so wore the Imperial Service badge over the right tunic pocket. By the time The IW Rifles shipped out, George was a Lance Corporal and is so named on his 1915 (Gallipoli) Star. They went to war on the Aquitania and landed in Suvla Bay, Gallipoli on August 10th 1915. At 4.45pm on Thursday August 12th, the IW Rifles went into action for the first time. George survived the attack, but his sister's boyfriend, Adolphus Ballard was killed. He was 17 years old. On, or about 20th October 1915, a communication was received by George's parents from the Territorial Force Record Office in Exeter stating that George had been in hospital in Alexandria since 25th September suffering from "Severe Fever (not yet diagnosed)". He was still recovering in Egypt well into November but was repatriated later that year.. In April 1916 he was moved to an Enteric Convalescent Camp in Surrey. Once recovered, (around June 1916) George was assigned to 14th Battalion Hampshire Regiment, service number 27756, and served on The Somme until late December when the 14th Hampshires moved to an area near Ypres. In his last letter home, dated 20th September 1917, George says "Tell Dad I'll not worry about anything for his birthday now, but will make up for lost time when I do come home, which I hope won't be very long now". He was killed in action on 26th. The IW County Press dated 10th November 1917 lists George as " - missing on the Western front. 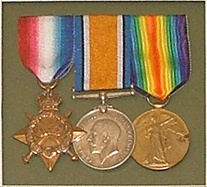 Corporal White had been wounded twice, in Gallipoli and France. Before the war he was working for Mr. G.C. Drabble in the gardens of Los Altos." His older sister, May, wrote to the Red Cross Enquiry Department For Wounded and Missing and received two replies containing reports of George's death. *Private C. Pook says - "White was a Corporal in 8th Platoon, and came from the Isle of Wight. He was a Platoon Sergt. on Sept. 26th when we went over and took and held a piece of the German line, being relieved on 28th. While going over, and I should think about half way over, White was leading our Platoon and I and Corpl. Jack Freshwater were following about 10 yards behind. I saw a high explosive shell fall right into a group of three or four men with Corpl. White and they must all have been killed." **Private T. Oakley says - "We went over the top at Tower Hamlets just as it was getting light and I was in a shell hole adjoining another in which were White and three men when a shell burst in a hole they were in and Corpl. White was killed. I had to go on with the advance and cannot give any more information." The IW County Press dated 31st August 1918 states - "Previously reported missing, now reported killed, Corporal G. White, Hants Regt, Lake." George's mother refused to believe he was dead and as a consequence, his name does not appear on the War Memorial in Lake. He is, however, mentioned on his father's grave stone (1932) in Lake Cemetery but even then as "missing at Passchendaele". Notes from George's letters Aug 5th 1915 "We should never have had such a trip as this if we were in civil life and all for nothing too". This refers to going to war on the Aquitania (mentioned in a later letter). Aug 18th 1915 "This would be a fine place in Peace time but it is a bit dry and water is not very plentiful". Gallipoli - 6 days after the big attack. Aug 25th 1915 "she is a very nice girl ...". Nothing definite has been found except an unnamed photograph which may be the photo referred to earlier in the same paragraph. Aug 25th 1915 "You know the Sergeant who was billeted with me, well poor chap, he died of heart failure while we were in the trenches". 8/162 Lance Serjeant William Gardner Silvester 1888 - 1915 of Bettesworth Road, Ryde. Oct 24th 1915 "... we must cherish the thought that he died a glorious and soldiers death". Concerning Adolphus (Dolf) Ballard - a real "Dulce et decorum est pro patria mori" feeling? Mar 27th 1916 "Ypres in all its ruins .... battered beyond recognition, just fit work for the savages we are fighting against". 8/1682 Raymond Leach, born 1890, son of Walter and Jessie Leach of Lake Road (now Sandown Road), Lake - Bricklayer. Sep 20th 1917 "... will make up for lost time when I do come home, which I hope wont be very long". George was killed in action six days later. The letter and plaque sent to the families of soldiers killed in The Great War.